Our healthcare waste management service caters for every type of waste your organisation is likely to produce (clinical waste, pharmaceuticals, sharps, dental waste, controlled drugs). Whether you represent a hospital that requires a daily service or an acupuncturist that needs a couple of visits per year, our service schedules are tailored to meet your precise requirements. Greater focus on segregation required. The integration of new sector guides on GPs and dental practices. 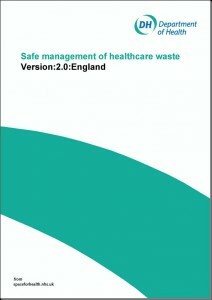 Focus on practical advice and examples for classifying waste. Confirmation of amended colour coding to assist segregation. medicines and medicinally-contaminated waste containing a pharmaceutically-active agent. clinical waste from municipal sources that are not in any way directly or indirectly associated with healthcare (for example needles and swabs from cosmetic body art or piercing, sharps drug litter and minor first aid or cosmetic procedures that do not involve or require a medical or para-medical practitioner legally recognised to treat patients) and that are similar to household waste. These are classified as non-hazardous solely because the only available EWC (20.01.99) is an absolute non-hazardous entry in the EWC. Any clinical waste, other than these two exceptions, being moved as a non-hazardous waste would indicate that the waste has been incorrectly classified by the producer, the holder or waste.